If you play Fallout 4, then you’re familiar with the game’s unique way of manipulating the passage of time. You’ll sit down with a controller in your hand, and an entire night is gone in what feels like ten minutes. It’s disconcerting. It’s addictive. You wouldn’t have it any other way. For non-fans, though, these intense Fallout marathons can be worrying. What could you possibly be doing in one game for so long? So with the release of the Far Harbor DLC in two short weeks, now is a good time to prepare the people around you for what to expect. To help you accurately explain your long absences to friends and loved ones, here’s a breakdown of what might happen in a typical four hours playing Fallout 4. 5 minutes: Preston has another settlement that could use the Minutemen’s help. Wait, didn’t he just send you to Tenpines Bluff last week? Whatever, you can be the hero for a helpless town. Again. 10 minutes: Decide that Dogmeat’s doghouse could really use some pizzazz. Write his name in neon on the fence behind it. Grab the pup as your companion and head out. You’re minorly inconvenienced by a pack of bloatflies, but nothing serious. 30 minutes: Kill ghouls at the Poseidon Reservoir for Tenpines Bluff. Lots and lots of ghouls. 10 minutes: Go to Goodneighbor to sell off your stuff from the ghoul fight. Clean KL-E-O out of ammo and Stimpaks, just in case. 10 minutes: Do a quick Silver Shroud quest. Briefly debate just eliminating the gun smuggling ring outright. Come to your senses and intimidate them into giving you a cut instead. It’s Goodneighbor, after all. 2 minutes: Listen to Hancock give a speech about how great his town is. 8 minutes: Go talk to Hancock. Laugh at Dogmeat running around behind him, but pay enough attention that you agree to do a favor for the head honcho. He will be your companion yet! 10 minutes: Leave Goodneighbor and wander, setting some cages. Your gladiator pit needs new victims. Accidentally stumble into a super mutant camp and get blown up by a suicider. 20 minutes: Redo everything since the end of the ghoul fight because you forgot to save. Stupid suicider. 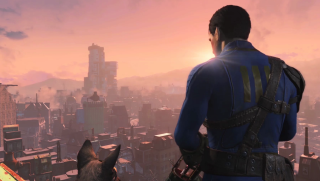 30 minutes: Successfully avoid super mutant attack and wander up to Bunker Hill, setting cages along the way. Make quick work of a raider pack outside the city. Dogmeat finds a stash of caps, mentats, and some pipe weapons. 5 minutes: Since he was such a good boy, you buy a red bandana from one of the traders and give it to Dogmeat. Admire how cute he is. Regret for the millionth time that there’s no option to pet him. 15 minutes: Start to have a conversation with a townsperson, when Dogmeat decides that he should be the center of attention. Laugh your head off as the pup inexplicably floats in midair and gets all up in your face. 15 minutes: Save video of Dogmeat glitching around, edit and post to YouTube. 5 minutes: Stash the junk from your inventory at Bunker Hill. 5 minutes: Review your guns and if you can make any mods for them. You’ve been hanging on to a couple unique weapons for ages that you never actually use. Make a new capacitor for Old Faithful, but you’re missing adhesive for the scope you want. 5 minutes: Look through your current quests for places that might have lots of junk. Hey, what a surprise, a settlement is having raider trouble! Perfect. 30 minutes: Kill raiders at Corvega Assembly Plant. Lots and lots of raiders. 10 minutes: Quick stop at the Drumlin Diner to sell. Remember to save after selling. Then back to Bunker Hill to finish making your new scope. 5 minutes: Tweet out your Dogmeat video.